Halloween is the time of year when children go trick-or-treating as ghosts and goblins and adults dress up to attend grown-up costume parties. If you live with social anxiety disorder (SAD), the thought of drawing attention to yourself with an outlandish costume might be scarier than any Halloween scene you could conjure up. If you have been invited to a Halloween party or plan to get dressed up to hand out candies on Halloween night, choosing a costume will be your first task. Below are costumes matched to how far along you are in conquering your social anxiety. Halloween is the one day of the year you can totally hide your face from view and no one will think twice. 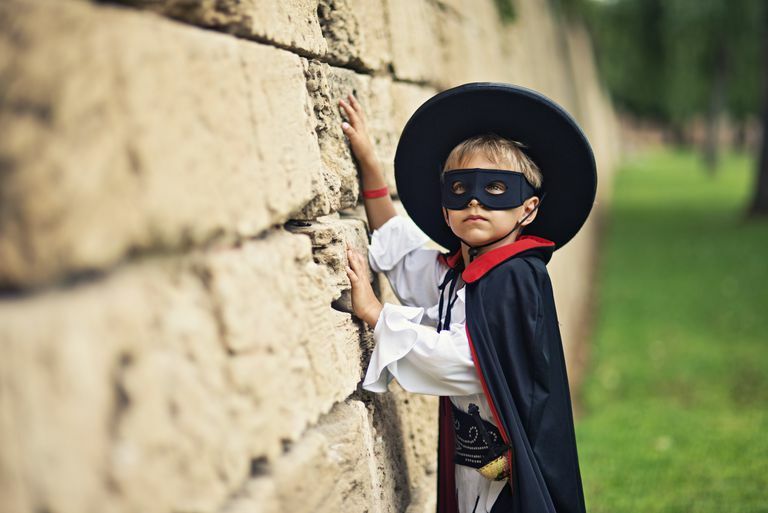 If you really feel like hiding this Halloween, grin and bear it by choosing a costume that allows you to at least hide your face a little, such as an animal or monster costume with a full head mask or a Zorro costume in which part of your face is obscured. Just make sure that whatever face-covering costume you choose still gives you plenty of room to see and make eye contact with others during the night. And—try to build up to a more revealing costume next year. Continually hiding could be considered a safety behavior, which will only make social anxiety worse in the long run. If you feel yourself start to relax, you could even remove your mask to challenge yourself a little. If you don't feel much up to making conversation this Halloween, consider a dressing as a character who would be expected to be quiet or mute. Costumes such as Edward Scissorhands or Charlie Chaplin allow you to be a little quiet and eccentric for the evening without anyone questioning your behavior. Remember though, if you feel the urge to break out of character and join in the conversation, Halloween is a great night to relax and let go of your social fears. Sometimes the best way to blend in during Halloween is to dress up as part of a pair or a group. Examples of pairs and group costumes include Batman and Robin, The Wizard of Oz, and The Flintstones. Another advantage of dressing up as a pair or group is that it gives you a chance to connect with others and have companions for the evening. Make sure that your costume is obvious enough to stand on its own, or you might end up getting puzzled looks all night. If you are feeling bold this Halloween, consider dressing in a costume that is an easy conversation starter. Costumes that are quirky fit the bill, such as a garbage can. Also consider unique costumes such as the dinosaur with a caged man or obscure costumes such as a character from Dr. Who. Conversation-starter costumes are a great way to break the ice, make people laugh and show your creativity and originality. If you really feel like breaking out of your shell this Halloween, try a costume that is in complete opposition to your usual personality. Examples might include superheroes, gypsies, french maids and other bold characters. If you aren't sure whether you can pull off an attention-getting costume, remember that Halloween is a night that you can be someone else. Take the opportunity to play a different part for the night and try out a different personality. No one expects you to be yourself, so this is a chance to really take some risks and push your usual boundaries. Made Man. Conversation-Starting Halloween Costumes.